WASHINGTON -- Secretary of State Rex Tillerson says the U.S. is working to "ensure equity" between the United States and Cuba by kicking out 15 of its diplomats. Tillerson is defending his decision to order Havana to withdraw the diplomats. He says the decision was made "due to Cuba's failure to take appropriate steps to protect our diplomats." He's referring to unexplained attacks in Havana that have harmed at least 22 American government workers and their family members. Tillerson says the U.S. is maintaining diplomatic relations and will cooperate with Cuba while the investigation continues. But he says his decision to withdraw 60 percent of U.S. diplomats from the embassy in Havana will remain in effect until Cuba can ensure that American diplomats there are safe. He says that move is needed to "minimize the number of diplomats at risk of exposure to harm." The move comes on the heels of last week's U.S. move to cut its own embassy staff in Havana by a similar proportion. A source familiar with the plans tells CBS News most of the Cuban officials asked to leave are known Cuban intelligence officers in the U.S., based in both Washington D.C. and New York. Not all of those asked to leave are "accredited diplomats" the American official said. The request marks yet another major setback for relations between the two neighbors, less than three years after they renewed diplomatic relations. It comes as the U.S. seeks to protect its own diplomats from unexplained attacks that have affected at least 21 Americans in Havana, in some cases harming their hearing, cognition, balance and vision. Tillerson discussed the plan Monday with President Donald Trump. 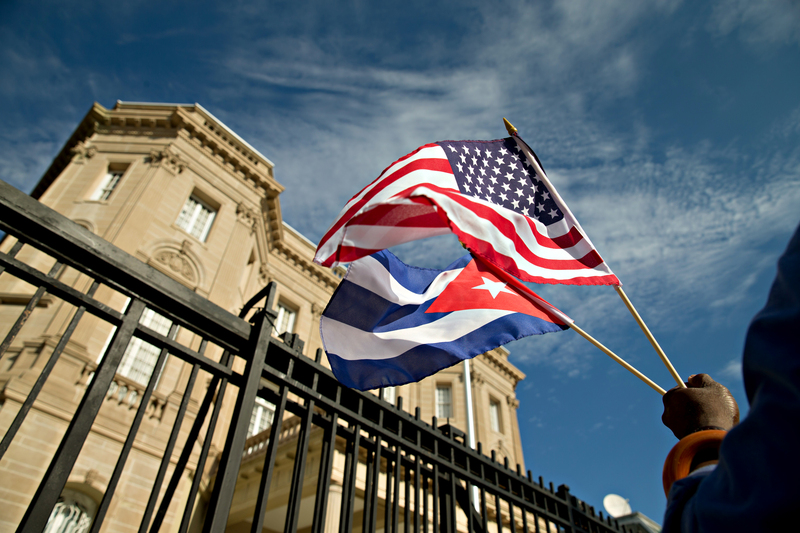 Cuba's Embassy in Washington did not respond to requests for comment. President Raul Castro's government denies involvement in the attacks, and is likely to view the move as unwarranted retaliation. Yet U.S. officials said the goal wasn't to punish the communist-run island, but to ensure both countries have a similar number of diplomats in each other's capitals. Medical records show severity of Cuba "health attacks"
On Monday, The Associated Press reported that U.S. spies were among the first and most severely affected victims. Though bona fide diplomats have also been affected, it wasn't until intelligence operatives, working under diplomatic cover, reported bizarre sounds and even stranger physical effects that the United States realized something was wrong, several individuals familiar with the situation said. The mysterious "health attacks" started within days of President Donald Trump's election in November, the AP has reported. But it wasn't until last Friday that the United States ordered more than half its embassy staff to return home. Delivering a one-two punch to U.S.-Cuba relations, the U.S. last week also delivered an ominous warning to Americans to stay away from Cuba, a move that could have profound implications for the island's travel industry. The U.S. said that since some workers had been attacked in Havana hotels, it couldn't assure Americans who visit Cuba that they wouldn't suffer attacks. "Because our personnel's safety is at risk, and we are unable to identify the source of the attacks, we believe U.S. citizens may also be at risk and warn them not to travel to Cuba," the United States said in a formal travel warning. Cuba had called that "hasty" and lamented that it was being taken without conclusive investigative results. But several U.S. lawmakers had said the move by Washington didn't go far enough, because President Raul Castro's government was being permitted to keep all of its diplomats in America. Sen. Marco Rubio, R-Fla., had called the one-sided action "an insult" in an AP interview. The U.S. previously had roughly 50 American workers at its embassy in Havana, so the 60 percent reduction will bring the figure down to roughly 20. It wasn't immediately clear how many Cuban diplomats will have to leave Washington to bring the two countries' rosters to parity. Although at first the U.S. called them "incidents" and avoided the word "attacks," the terminology changed last week and the United States is now comfortable asserting that they were deliberate attacks that targeted Americans, officials said. Still, the administration has pointedly not blamed Cuba, and officials have spent weeks weighing how to minimize the risk for Americans in Cuba without unnecessarily harming relations or falling into an adversary's trap. After all, there are several countries in addition to factions of Cuba's government that would have an interest in driving a wedge between Washington and Havana. To medical investigators' dismay, symptoms have varied widely. In addition to hearing loss and concussions, some people have experienced nausea, headaches and ear-ringing. The Associated Press has reported that some now suffer from problems with concentration and common word recall.